← Soundarya Lahari – Shloka #57: Shridevi Helps Her Devotees in Distress by Showering the Grace by a Merciful Look! Benefits: Getting liberation and entering into another person’s body. Meaning: O my Mother Shridevi ! The Holy Vedas hold your lotus feet as ornaments on theirs heads. [So,] Please be pleased to kindly keep your lotus feet on my head! The water that washes your lotus feet is the river Ganga(a.k.a Ganges) which flows over the matted hair of Lord Shiva. Your lotus feet, are adorned with red lac-dye, which have a red luster from crest jewel of Lord Vishnu! Shridevi’s lotus feet Grace the Highest Knowledge(Jnana): The verse suggest that all the secret knowledge of Holy Vedas are present in the Lotus feet of Shridevi. In Hinduism, the feet is synonymous of teachings of Great Masters. From this perspective, Shridevi’s lotus feet themselves are the guiding principle of the Guru(Master) which bestow the Highest Knowledge(Jnana). The devotee is pleading Shridevi to place Her lotus feet on his head. It means that he is requesting Shridevi to transmit the Highest Knowledge of the Holy Vedas from her sacred feet into his brain(or mind) directly. Shridevi’s divine feet bestow the liberation(moksha): In Sanatana Dharma(Hinduism) Scriptures, the holy river Ganga washes away the sins of a person so that he can attain liberation from a vicious cycle of birth and death. So, the verse, says the lotus feet of Shridevi are capable of cleansing ourselves to make us free of our past karmas to achieve liberation. The devotee is requesting Shridevi to grant him liberation(moksha). Shridevi’s beautiful feet grant material wealth(bhoga): Look at the words: 1. Lakshmih means splendor. It also means Shridevi Lakshmi, the consort of Lord Vishnu. It is amazing that this word has been so nicely and strategically used to mean both! 2. Chudamani(Crest jewel) and Hari(Lord Vishnu). All these words esoterically suggest one thing: luxury and material prosperity(bhoga). So, the shloka implies that Shridevi’s lotus feet are infinitely powerful to bestow material prosperity(bhoga) to the devotee. Esoteric Meaning #2: The first two lines of the verse deal with the knowledge, the next line pertains with liberation and the last concerns with prosperity. It shows the relative priority and importance to be given for these aspects in human life. So, for the seekers on the spiritual path, the first priority is to gain the Highest Knowledge to achieve complete liberation from our trans-migratory existence. The last priority is to attain temporary prosperity. For the house-holders, the order of priority is reverse. To become prosperous should be the first priority to sustain the family life and related obligations. The next is to gain the Highest Knowledge to liberate oneself from the continuous cycle of birth and death. In fact, material enjoyment(bhoga) and liberation(moksha) are two most important aspects of human life. The order of priority and significance depends on affiliation and goals of the person. Esoteric Meaning #3: The first three lines of the verse are on the top, towards the sky. They indicate the supreme goal beyond this world. The last line at the bottom of the verse is closer to the ground(as you read! ), implying the need of prosperity while living in this world as house-holders. The esoteric message is that Shridevi’s Grace is very helpful in having prosperous life on this Earth and liberation beyond this temporary world. Esoteric Meaning #4: Ponder on the words Pashupati jata-juta(plaited hair of Lord Shiva) and Hari chudamani(crest jewel of Lord Vishnu). They indicate ascetic life of a true seeker and material life of a house-holder. Shridevi’s lotus feet are very powerful to help us in both the cases. The word Shruthinam(of the Vedas) indicates the Guru(Spiritual Master), who is the bridge between material and spiritual lives and guides us to realize the Ultimate Reality. Esoteric Meaning #5: Think again on the phrase pashu-pathi-jatajuta-tatini meaning the river that flows from plaited hair of Lord Shiva, i.e. holy river Ganga. Why is Lord Shiva coming into picture here? It is to show the oneness of Lord Shiva and Shridevi Parvati! It suggests the Ardhanarishwara form of Lord Shiva in which right half is Lord Shiva and the left half is occupied by Shridevi. Since Lord Shiva and Shridevi are together as one, the Ganga flowing from the plaited hair of Lord Shiva obviously washes the lotus feet of Shridevi Parvathi on the other side! What a great insight! Hats off to the mystical nature of Soundarya Lahari hymn! Esoteric Meaning #6: Matah sirasi dayaya dehi charanau meaning Mother, kindly keep your lotus feet on my head. Here, the devotee or Great Universal Master Shri Shankara Bhagavatpadah is addressing Shridevi as caring and affectionate mother. Not only that he has completely surrendered to Shridevi to request her to keep the divine feet on his head! What is the message here? 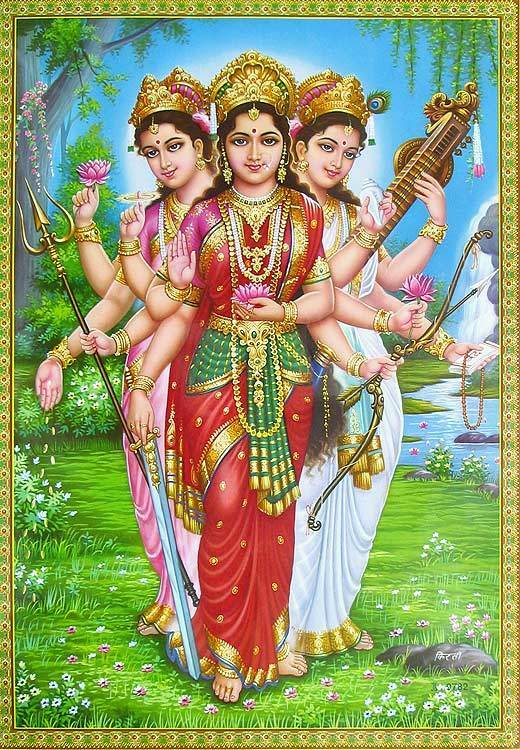 If we respect Shridevi as our Divine Mother and surrender to her completely, She takes care of us in every aspect of our lives whether it is spiritual or material. Period. Let us pray all powerful Shridevi Durga for Her Grace! Words of Beauty: Here are the bunch of sweet words that offer a nice melody and rhythm to the verse: tha-va, shekhara-thaya; mama-pyetau, ma-tah; da-yaya,de-hi; paa-dyam, paa-thah, Pa-shupati; ja-ta, ju-ta, ta-tini; laksh-a, laksh-mih. Relish and enjoy! This entry was posted in Soundarya Lahari and tagged glory of shridevi, meaning of 84th sloka of soundarya lahari, meaning of soundarya lahari sloka 84, meaning of soundarya lahari slokas, power of devotion of Shridevi, power of graceful look of Shridevi, power of shridevi, soundarya lahari, soundarya lahari meaning, soundarya lahari shloka 84, soundarya lahari sloka 84, soundarya lahri. Bookmark the permalink.